Should the Production Lexus LF-LC Look Like This? Discussion in 'Lexus Lounge' started by Gecko, Sep 2, 2015. 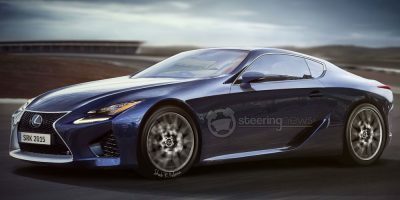 Taking cues from the prototype recently spotted in California, the Steering News website has rendered a guess at the possible Lexus LF-LC production model. This might be pretty close to the production model. No rear floating roof? I would be surprised to see this go since the 4RX has it. I agree. I hope and believe it will have the floating roof. Not a bad rendering,overall. Not a bad rendering considering how much close the mules look to the LF-LC - fairly easy to predict the design. However, I believe the front end will look less RC F like and more dramatic befitting of a 100K+ vehicle. We'll see. Lasse J. Nordvik, Joe and RAL like this. Nice rendering, but the hood doesn't seem to match the camo'd prototype, unless there's some clever padding going on. RAL and Joe like this. Close... but no cigar. Too much RC F in the front on this one. By the way, it should not be too difficult to make a good rendering of the final product, as it has been said and written before that the production version should be 90% close to the LF-LC. I'm curious what dimensions are. I assume this will be quite a bit bigger than the RC. Joe and IS-SV like this. I agree...... the front end is way to similar to the RC F.
I hope the dimensions are around Length: 190-192 Wheelbase: 112-113 Height: 45-48 Track: Wider the better. corradoMR2 and RAL like this.